The P99 was the precursor to the now famous PPQ. While the latter overshadows the former now, that doesn’t negate the fact that the P99 was the original foundation of excellence that Walther carved from concealed carry gold. The Walther P99 was the most ergonomic pistol of its time and may still be. Pistols like this are why Walther has such an impeccable reputation. is created from unique designs that push the boundaries of concealed carry forward into the future. A small footprint is an important feature on a Walther P99 Kydex holster. Big holsters just don’t conceal as well and they can’t touch the comfort level of our small footprint designs. Even an OWB rig works better at concealed carry if it’s smaller. The smaller it is, the less likely it is to be spotted through your shirt. It’s always easier to conceal a small Clinger Holster than a big rig from another company. You can rest assured that your gun holster from Clinger will be a perfect fit for your handgun. We custom mold every holster we produce to be a perfect fit. We use today’s latest technology to ensure our molds are cut to the exact dimensions of your pistol. If you want the best, you’ll want our American made products. Our American workers use pride and care to carefully assemble your Clinger Holster. Everything we sell is backed by our Lifetime Warranty so your investment is well protected. 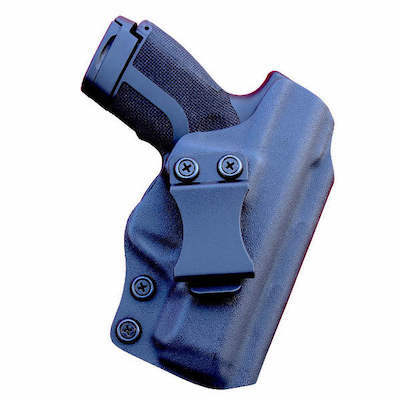 Plus, we back up every Walther P99 holster we make with a Two Week Buy Back Guarantee.